Covering an area in a valley between a mountainous area Drama is a central city in Northern Greece known for a number of events and sights around it. Taking its name from the Greek word "Ydrama" which roughly translates to "water park" Drama is a place of rare natural beauty and unique character. You can travel to Kavala international airport and then catch a bus to Drama. You can get a train from either Thessaloniki or Athens. Cost is cheaper than by bus.The train station in Drama is about a 10 minute walk from the centre. With the now completed "Egnatia" freeway you can reach Drama in less then 2 hours from Thessaloniki, and in around 30 minutes from Kavala. The best way to reach Drama is by the bus,frequently travelling from Thessaloniki (15euro for a single ticket). You can take the bus at the central bus stations, called "KTEL" (Greek national busservice) from Thessaloniki (around 2 hours, 15 euro) or Kavala. The bus station in Drama is about 3 minutes from the center near "plateia elefterias" (freedom square) the main square. 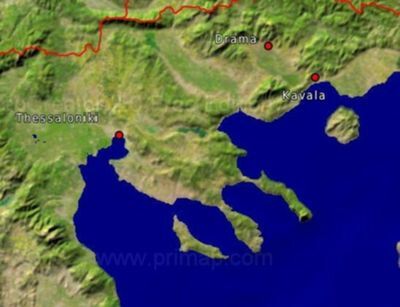 The nearest harbour is Kavala, mainly serving the routes between Kavala-Thassos, Kavala-Lemnos-Lesbos-Athens. One of the best things in Drama is the outstanding natural beauty of the surrounding areas. This might be tricky to reach and Drama does no get the tourism it deserves therefore it is best reached by car. But if you are thinking of seeing a part in Greece that is not spoiled by tourism then this area is for you. In the city there are cozy restaurants and Ouzo places as well as a booming nightlife of very luxurious cafe-bars for the size of the city. There are also a number of nightclubs some near the area of the center and some a little further out of the city center. walk around the area of the train station for some old houses and do see the "Kapnomagaza" (tobacco warehouses) in the east of the Agia Varvara park. Some of those are now being converted to museum buildings for exhibitions. In the north of the main square, around 30 minutes by foot there is a small hill that you can take a hike, on the top of the hill there is a coffee shop. On the east of the city there are a number of old churches, some with old decorations and paintings of byzantine style. Rhodope Mountains National Park: it can be reached from from the village Paranesti or the village Sidironero. It is a huge sparsely populated mountain area with fantastic landscapes, lakes, waterfalls and remarkable flora and fauna. The best information about this area, in which only a few tourists get lost, are unfortunately in Greek and only few in English (www.fdor.gr/index.php, partetavouna.blogspot.gr). Most attractions can be reached by dirt roads only, which in the summer are also accessible with a normal car if you drive carefully. in the winter sports center, hiking, mountain climbing, for tours with special-purpose vehicles and air sports. In winter, the Falakro was a very popular ski center until the economic crisis. The winter sports center consists of 9 lifts and 20 runs and was the largest winter sports center in the province of Macedonia and after Parnassus along with Kalavryta the second largest in Greece. On Falakro 3 chalets, 4 shops, ski rentals and ski schools are operated. The nearby ski area in Bansco, Bulgaria is a serious competition. In the summer, the diversity of flora and fauna and the fantastic views attracts many visitors and it is there even on the hottest summer days nicely cool. Do go for a coffee on one of the luxurious coffee places and do eat at a local taverna. Drama is well known for its night life which attracts lots of people from surrounding cities. There are also an archaological museum and a religion history museum in the city. Surrounding the city there are a number of archeological sites, including the "philipoi" ancient theater. This is an operational theater and remakes of ancient Greek theater plays are played here. Do visit the Archeological sites surrounding the city and do see some very interesting forests in the surrounding mountains. Volunteering work in the area of Drama is possible during the christmas period where the central square is transformed into a theme park known as "oneiroupoli" (city of dreams), you can contact the city municipality for information. Drama has a very competitive market for its size and you can find practically anything you would expect in a major city. The market is closely packed together surrounding the main square. Stefanos, follow the road towards the west from the main square, offers Greek "suvlaki" änd "gyros" sandwiches (around 5euro per person for 2 sandwiches). Kalamia, towards the east of the main square next to a bank, offers "kebab" style grill, (around 5euro per person for 2 servings). Bugatsa Lefteris: Next to the taxi park between the central square and the park, offers greek "bugatsa" (cream filled pasty), around 1.5 euro per serving. Goody's: opposite the square on the right, greek hamburger franchise, around 5 euro for a meal. Lukulos: Located outside of the city, this is an extremely luxurious restaurant. Kafe Elefteria Probably one of the oldest coffehouses in the city, in the now renovated old building serves plenty of hot and cold drinks. Located north of the main square. Kafe Aigeo Serving a younger crowd this lively bar is located of the west of the agia varvara square. It gets very crowded on weekends and the music is loud. In a city that is unspoiled by tourism you should try to maintain a respectful communication towards others as extreme behaviour towards people might cause a scene. Also try to avoid getting involved with any local disputes. Crime in Drama is nearly non-existent. The weather can be very hot during summertime and the winters are usually cold and breezy with some snow. This page was last edited on 23 March 2015, at 14:03.